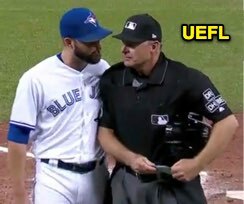 HP Umpire Ed Hickox ejected Blue Jays pitcher Ryan Tepera (balls/strikes; QOCN) in the top of the 8th inning of the Red Sox-Blue Jays game. With none out and none on, Tepera struck out Red Sox batter Brock Holt, surrendered a double to Sandy Leon, walked Mookie Betts, gave up a single to Andrew Benintendi, induced a ground ball force out from Mitch Moreland, gave up a home run to JD Martinez, and secured a groundout from Xander Bogaerts. Replays indicate of the 11 callable pitches during the half inning preceding Tepera's ejection, Hickox correctly officiated 10 of them (10/11 = 91% accuracy) and the incorrectly officiated pitch was the 0-0 pitch to Martinez; by rule, given Hickox's overall inning performance and the timing of the sole miss, the call was correct. * At the time of the ejection, the Red Sox were leading, 5-3. The Red Sox ultimately won the contest, 10-7, in 10 innings. This is Ed Hickox (15)'s first ejection of 2018. Ed Hickox now has 8 points in the UEFL Standings (4 Prev + 2 MLB + 2 Correct Call = 8). *UEFL Rules 6-5-c-5-d and 6-5-d govern this QOC. A 0-0 pitch improperly ruled a ball does not satisfy the "realistically resulted in a different outcome" criterion of 6-5-c-5-d and an accuracy rating of 91% exceeds the benchmark established in 6-5-d. Thus, this is a QOCY ejection. This is the 111th ejection report of the 2018 MLB regular season. This is the 53rd player ejection of 2018. Prior to ejection, Tepera's line was 1.0 IP, 4 ER, HR. This is Toronto's 7th ejection of 2018, T-1st in the AL East (NYY, TOR 7; BAL, BOS 3; TB 1). This is Ryan Tepera's first career MLB ejection. This is Ed Hickox's first ejection since June 8, 2014 (Clint Hurdle; QOC = Y [Balls/Strikes]).